CAP Talk | Operations | Tools of the trade | Topic: Consider Tampons for your 24 hour pack. Re: Consider Tampons for your 24 hour pack. Just press releases and AARs if they are completed / distributed. I don't recall any in my AOR where aid was rendered for anything but minor injuries. As mentioned above, with GA crashes it's usually either "walked away" or a fatality. One of the drivers of our squadron van has " feminine Hygeine products" in case one of our female members needs them. I really hate to pile on, but I cannot discourage this strongly enough. While I typically don't appeal to authority, I'm an Army Medic with nearly 10 years ARNG side and a deployment to Afghanistan. I've recertified as a 68W 3 times, attended BCT3, taken part in live tissue labs, a Combat Medic Mentorship Course, and conducted thousands of hours of OJT and real-world work as a Healthcare/Trauma Specialist on the military side. Do not pack tampons to provide bleeding control for penetrating trauma of any kind. That's not what they're designed for. They're designed with a very specific purpose, and an untrained person could cause significant harm if trying to employ them in the manner suggested by the OP. The Army standard (for non 68Ws, per the AWT Guide) is to pack Kerlix (or Combat Gauze/other hemostatic gauze if available) into the wound in order to control bleeding. The 68W standard is to pack Kerlix (or Combat Gauze/other hemostatic gauze if available). The Marine Corps standard is to pack the wound with Kerlix (or Combat Gauze/other hemostatic gauze if available). The Navy standard is the same. The Air Force standard is the same. These are the organizations that deal with this type of injury on a regular basis. They are, arguably, the source for standards and best practices regarding penetrating trauma. The bottom line is this: What were you trained to do? What are you, as a CAP member, allowed to do? If your response to those questions does not include "packing wounds with tampons," then you're wrong if you're packing them in your 24 hour gear with any purpose other than addressing menstrual bleeding. 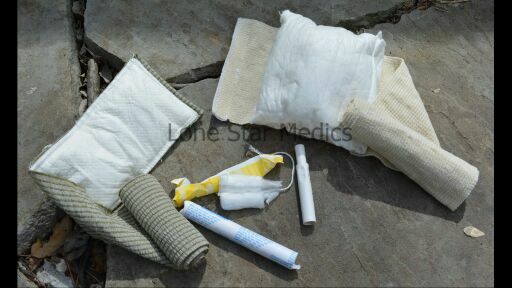 I hope the image works- but take a look at two common combat bandages and then the tampon. They do not expand that much. For every expert that recommends them (and I've had buddies say the same to me) I can find plenty more who have taken a tampon apart or otherwise done actual research into why it is a bad idea. See the above post- gauze is much more effective. Let's stick with built for purpose here. It's a nice idea, but not a great one. Gauze rolls and pads also have many uses, if you aren't afraid to use it on regular cadet needs instead of "Only The Big One." Plenty of scrapes shins, even can fashion a triangle bandage if you pick good multi-purpose supplies. I added a travel pack (3) of them to the team first aid kit, simply because my philosophy for a team first aid kit is broader than Band-Aids -- it includes items for safety and comfort, like sunscreen, insect spray, etc. I've added a mesh bag with most of the OTC medications listed on the national release form. Unexpected situations do happen with missions and such, and sometimes a member forgets something they might need, which may not be easily acquired at 3am... The additional reason is because they are absorbent. Miserable members are ineffective, so some Pepto-Bismol tablets can be a lifesaver. Not a CAP member but I would be hesitant giving them to a cadet without specific parental permission due to the risk of TSS and perhaps religious beliefs. Cotton dryer lint is far better tinder. Cotton balls soaked n Vaseline and wrapped in aluminum foil work VERY well. I don't think tampons in the 1st aid kit will light many fires except on this thread. If you're stuck in a bathroom at Pulse Nightclub during an active shooter event and there's a tampon dispenser in the stall, then by all means, use one or 20 of those things to help control bleeding. But if you're packing/stocking your IFAK, blowout kit, ground team medic kit, or vehicle first aid kit with tampons, then I really don't want you tending to my wounds because you really don't get it. There are so many better and more appropriate tools that are made to control bleeding from trauma, that if you don't get it, you won't get it, and you're just trying to "wow" people with your wanna-be ditch medicine knowledge. Stick with the tools that are designed and available for casualty care, not what could be used in an extremis situation. I say go ahead and put one in your IFAK(great for nose bleeds). I see alot of untrained and unqualified people in CAP carrying around med equipment they should not have. People in CAP need to stop playing EMS. When we went through CERT training, during the First Aid portion our instructor advised to include a couple of tampons in the first aid kit mostly for nose bleeds and for their intended use. Our instructor is very active in the SAR community as a medic, is EMT qualified and works at the local ER. There is no way as a team leader that I'm dispensing tampons to cadets on my team, lest I face irate parents. I do usually stock pads, though for the intended use only, after I had an extremely embarrassed cadet come to me requesting something, anything, a couple of decades ago. One could make an argument that females need to stock them in their personal kit and not rely on Team gear. However, for whatever natural reason (strain of new circumstances on an FTX, in the case I had?) you cannot tell when the situation might arise the first time without warning. In those cases, I judge it to be an emergency. For the suggested purpose, QuikClot "combat gauze" is a better choice. Can help clot off the bleeds and will be easily identified on an x-ray. The only reason I can think of why tampons could be suggested would be the cost vs the correct stuff. People can easily justify an inferior product when the cost is 90% cheaper than the correct product. I'm an EMT and don't carry tampons in my personal trauma kit, I carry a few different types of QuikClot gauze ("combat" and EMS versions). I texted two former CAP cadets last night regarding this subject and asked what THEY would put I'm a individual first aid kit (IFAK) or "blowout kit." One is a highly decorated PJ (Distinnguished Flying Cross w/Valor) and the other is a Special Forces officer, between the 2 of them they have 8 combat tours in Iraq and Afghanistan and have dealt with new gunshot wounds, among other trauma injuries than anyone on CAP Talk, short of a doc or career paramedic from a city like Chicago. If you were making a a personal blowout kit that fit into a Ziploc (cargo pocket) sized bag, what needs to be in it? -ace bandage, if you don't have an Israeli bandage. I think if you're narrowing the mechanism of injury to gunshot wounds, you wouldn't need a nasal pharyngeal or a trachea kit. Obviously, blood pressure will be a concern, but with that size of a bag,an IV or IO kit won't fit. Tom [the PJ] how did I do? Mother of pearl, this is still a conversation? BLUF: use the right tool for the right job. Never had much of use for them otherwise, except for well, the obvious use - I do find female cadets forget to pack things, and do carry a supply to cadet events. This has been addressed earlier, but the difference between a pad and a tampon being provided to a female cadet can be significant, especially since Toxic Shock Syndrome is no small issue (especially given the stress and potential field environments at CAP events). Can't agree with this statement anymore. Toxic Shock is a very real possibility because most Tampons are chemically treated for different reasons. Ultimately, the chemicals you are introducing into spaces that they were not intended.